along with color, taste, and variety. For years, there’s been a common notion that you get the best nutritional punch from a few well-publicized foods, such as blueberries, black beans, and broccoli. Well, they can move over now and make room for a surprising new addition: guava. Until recently, only limited information has been available about the nutritional composition of tropical fruits—especially the more exotic ones. But in south Florida, growers are not only producing guava, carambola, mango, papaya, and citrus, but also pitaya, sapodilla, lychee, longan, and mamey sapote. So researchers at the U.S. Citrus and Subtropical Products Research Laboratory at Winter Haven, Florida, have been using standard methods to analyze these fruits for components that could be beneficial to human health. Heading the effort is the lab’s research leader, horticulturist Liz Baldwin, with ARS scientists John Manthey, Gary Luzio, Anne Plotto, Jan Narciso, and Kevin Goodner and research associate Kanjana Mahattanatawee, in collaboration with scientists at the University of Florida’s Citrus Research and Education Center in Lake Alfred. They’re also cooperating with researchers at Siam University in Bangkok and Chiang Mai University, both in Thailand, where some non-Florida native variations of these same fruits are available for testing. At the lab, they are analyzing all these fruits for phytonutrients, flavor, and several other components. Technician Holly Sisson (left) and horticulturist Elizabeth Baldwin homogenize guava for antioxidant and pigment analyses. The function of natural antioxidants and dietary fiber in foods and biological systems has received a lot of attention lately. Fruits and vegetables are playing an increasingly significant role in the daily diet, because many of them provide an optimal mix of antioxidants—such as vitamins C and E, polyphenols, and carotenoids—along with complex carbohydrates and fiber. Antioxidants are plant chemicals that have the power to neutralize free radicals, which are harmful compounds that are both generated inside human bodies and found in pollutants like cigarette smoke. Reducing free radicals can only improve human health because the oxidative damage they cause to human cells is believed to trigger various chronic diseases. Free-radical damage has been linked to cancer, Alzheimer’s disease, rheumatoid arthritis, cardiovascular disease, cataracts, age-related macular degeneration—and to the aging process itself. It’s no wonder that nutritionists and scientists have—for years—recommended that we eat five to nine servings of fruits and vegetables each day. Food writers and marketers have been emphasizing foods known to be high in antioxidants—adding chocolate, oats, onions, soy, spinach, sweet potatoes, tomatoes, and walnuts to the list. The Winter Haven scientists have gone in search of even more high-antioxidant options. 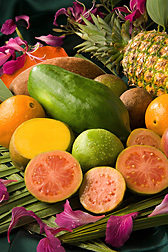 Guava, the juicy, pink, sliced fruit in the center, is high in antioxidants. Using a variety of methods to analyze for individual nutrients, the researchers have shown that carambola (star fruit), red pitaya (also known as “red dragon”), and mamey sapote are all high in antioxidant compounds called “phenolics,” and mamey sapote is also high in fiber. But the one fruit that beats them all is guava. It had the highest antioxidant potential (measured as ORAC values), total phenolics, vitamin C, and dietary fiber. ORAC—or oxygen radical absorbance capacity—is a measure of the ability of foods and other compounds to subdue oxygen free radicals. The higher the ORAC value of a food, the more antioxidant power it contains. This is measured by using a 96-well fluorescence microplate reader—an advanced device with high sensitivity and the ability to carry out kinetic studies, such as this one, which require that many ORAC assays be run simultaneously. Guava’s antioxidant content proved to be around that of orange, grapefruit, and broccoli, and just below that of spinach—all foods that are considered to be high in antioxidants. Other fruits that ranked surprisingly high in antioxidants included lychee and papaya. More detailed results were published in a 2006 issue of the Journal of Agricultural and Food Chemistry. A grant from the Tropical Fruit Growers of South Florida helped fund this research.—By Alfredo Flores, Agricultural Research Service Information Staff. Elizabeth A. Baldwin is with the USDA-ARS Citrus and Subtropical Products Research Laboratory, 600 Ave. S, N.W., Winter Haven, FL 33881; phone (863) 293-4133, fax (863) 299-8678. 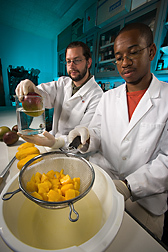 Technician Christopher Ference (above left) sanitizes a whole mango before cutting it into pieces while technician Keith Williamson dips the mango pieces in an edible coating designed to prolong the cut fruit’s shelf life. ARS horticulturist Liz Baldwin, plant physiologist Anne Plotto, microbiologist Jan Narciso, and Thai collaborators are developing coatings and surface treatments to maintain the red color of lychee fruit and protect fresh-cut mango. Most of the work has been done through a collaboration that began with Nithiya Rattanapanone, who is with the Faculty of Agro-Industry at Chiang Mai University (CMU). Rattanapanone first visited the U.S. Citrus and Subtropical Products Research Laboratory (USCSPL) in Winter Haven, Florida, in 2003. That was the start of a mutually beneficial partnership between ARS and Thai scientists. 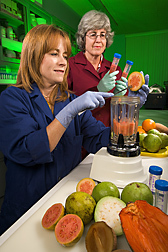 In 2004, Baldwin visited CMU to give a workshop on edible coatings for fruits and vegetables and to work on developing coatings for cut mango. For 3 months in 2005, Usawadee Chanasut, a professor with the Postharvest Technology Institute at CMU, and ARS chemist John Manthey worked together at Winter Haven to determine the antioxidant potential of Thai eggplant. Chanasut is now finishing that study in Thailand. In 2005 and 2006, Rattanapanone returned to Winter Haven to compare results from experiments there and in Thailand on edible coatings and other surface treatments for reducing browning of lychee peel. Several of Rattanapanone’s students have visited USCSPL to work on their doctoral thesis research. One of USCSPL’s former postdoctoral associates has joined the faculty at Siam University. Kanjana Mahattanatawee worked on tropical fruit flavor and phenolic compounds while at Winter Haven and is now continuing this research at Siam University. She plans to return to Winter Haven this year for further collaborative studies.—By Alfredo Flores, Agricultural Research Service Information Staff. "Great Guava!" was published in the October 2007 issue of Agricultural Research magazine.